Well I woke up this morning after the holiday party and all is well in the world. The party was a great time to catch up with friends. The Leafs beat Ottawa. The Sabres beat Boston. UB lost but they are going in the right direction with a great coach. And the Bills…… never mind. There was centerpin talk and steelhead talk at the party. I am still working on Tom’s wife to give him that green light for a purchase of a new reel. After all he didn’t get the down rigger rod and reel for Christmas that he was expecting. I do duty as Tom’s cabin boy in the summer trolling Lake Ontario for salmon and steelhead so I am trying to help a brother out. There was a guy at the party who just started pinning and one of his buddies hooked him up with a Bob James and he got a deal on a Loomis float rod. I don’t know if it was a frontier, GLX, or IMX. But the guy is excited and had done well this fall catching fish. His hot bait was mousie grubs and he told me he was slaying the fish on the smaller Erie tribs this fall. He suggested Tom get a Kingpin but I don’t know if that will fly with his significant other. He may need to start out with a Raven or look for a good used pin. But saying this it is probably better to get the good stuff up front so you’re not investing more in 6 months or a year. Come to speak of it. After a Godforsaken ever life sucking 2008; I should treat myself to a new toy sometime in 2009. I don’t need a new rod. I love my 10 yr old Loomis IMX from LG Custom. It has been a trooper and there are no complaints. The G Loomis reel has been around for along time and is a middle of the road reel. While not top of the line it has preformed without complaint for years but it may be time to upgrade. What will it be? A left handed Milner? A Kingpin? A new Stanton? MMMMMMM…………………….. I did get out yesterday for an hour and a half and encountered more slush that the day before and air was 29 degrees. 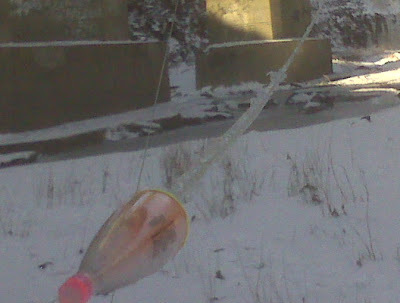 I developed the frozen rope syndrome above my float. Two and ½ feet of ice encrusted line and float. Hence why I said screw it after an hour or so and went back to the couch. The temp is in the teens this morning but it is supposed to get into the middle 30’s sometime today. That “sometime” will dictate when I get out. At this time I am disgusted with shelf ice and slush and miss my 45 degree days with green water which were always accompanied with cooperative silver fish fresh from the lake. Before I end this entry, please say a prayer for the car I saw overturned this morning on the 90. I was on a intersecting over pass and looked down to see a car upside down on its roof in a ditch with the paramedics and fireman doing what they do best. The victim must have hit black ice and I prayer who ever it is that they are OK and have survived. They are somebody’s family somewhere. Thank you and back to the coffee……………………. Geesh Joe...You are having a dry spell on the chrome front yourself. Right now I'm crawling in my skin with facing the return to work tomorrow and not having fished for a few weeks. This Wednesdays trip to the Muskegan will be very healing. Can't wait!!! As for your interest in another pin...be careful ;0) That can become addicting. Craig at Erie Outdoors now has one of the new Stantons if you want to have a look and feel. Well the mouth of 18 is frozen so there are no fresh fish coming in. Then add all the spin fisherman bonking the steelhead on thier head to put in the smoker. So you are stuck with a finite number of fish. i can see the steelies moving from pool to pool much in this cold weather. commader Tom just call. we are going to go this afternoon to a more urban fisher Cayuga creek near his home. I need to change it up to off the cold streak. He said there is no slush their and the water is green.